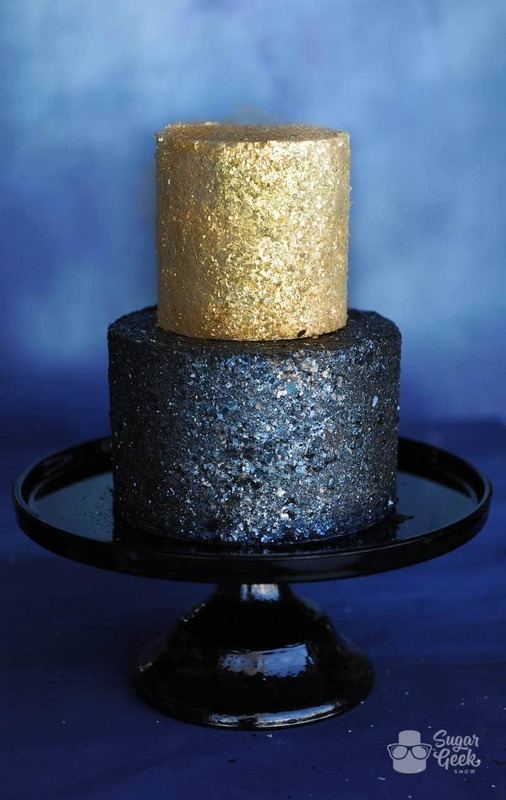 This edible glitter recipe is sparkly, easily customizable and made from 100% edible ingredients. So what’s considered edible? Well if you gain nutrients from eating the product and it is FDA approved as food, then it’s considered edible. Is it safe to eat edible glitter? There are a lot of products out there that claim to be edible but are just non-toxic. What does non-toxic means? Well imagine you ate a crayon. Will it taste good? Probably not. Is it edible? Technically not. See, when something is considered non-toxic, it just means it will pass through your body without harming you but you also do not get any nutrients from it so therefore, it is not a food. Disco dust commonly refers to a product that is considered to be non-toxic but not edible. You know what else is non-toxic? Actual real glitter. The plastic stuff you buy at the craft store literally is the same thing as disco dust. Do you really want to eat plastic? I didn’t think so. Just say no to disco dust unless you’re putting it on a part of the cake that can be easily removed and is very clearly not meant to be eaten. The great thing about making edible glitter is that it’s pretty dang easy. You probably already have all the ingredients you need for it in your shop (if you’re a cake decorator). You can also switch up your colors and dusts depending on what you have on hand, but I prefer to use TruColor metallics. Because they are 100% natural mica-based pearlescent pigmented metallics with tons of shine. They also come in a variety of beautiful colors! 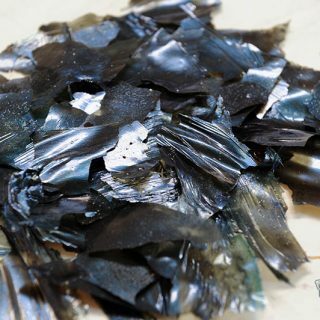 They are made with real minerals that are safe to consume and I think that’s what gives them their extra shine power. How do you make edible glitter? 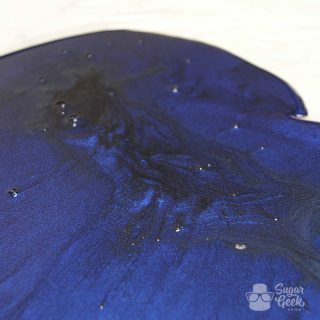 For this tutorial, I am using the deep blue shine dust. My favorite color! It was actually an Elite gift for December because I wanted everyone to love it as much as I do, haha. So if you’re an Elite member, you’re in luck because you probably already have this dust! The basics of this recipe comes from my sheet gelatin recipe which is basically turning powdered gelatin into a sheet that kind of resembles plastic. Heat for 30 seconds, stir and and another 15 seconds until fully melted. Don’t overheat it. 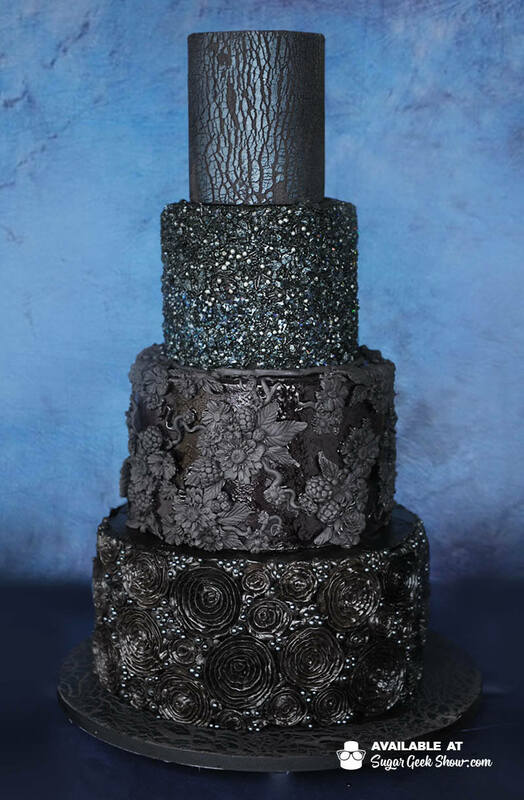 This dark blue edible glitter is perfect on our black textures wedding cake tutorial and adds that pop of sparkle that makes the sprinkles look extra moody and gorgeous! 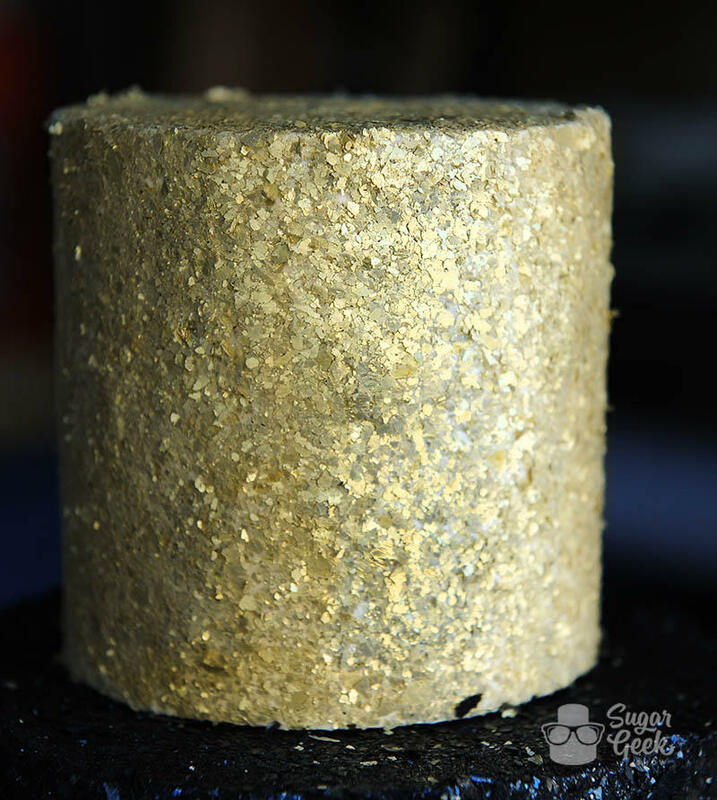 Truly gold sparkly edible glitter is hard to come by. I’ve experimented with many different recipes and I think I have come up with the best solution while still keeping things edible. The addition of the gold leaf will add a little bit more shine and sparkle when the mixture is ground up. This DOES add some added expense. Remember, making something with real quality ingredients will also increase the cost. Some recipes for edible glitter can get pretty complicated and call for ingredients that are hard to find. I totally understand this and feel your pain. That’s why I have tried to make a recipe that is fairy easy to make and have included alternatives in case you can’t find exactly what I used. Gelatin powder is carried in pretty much every grocery store all over the world in the baking section. If you can’t use gelatin for health or religious reasons, you might try experiments with agar agar which is made from seaweed. In this day and age pinterest can be super helpful but you know what else it has? Tons of mis-information and crappy tutorials that basically lie to you. For years now, there has been this image of straight up non-edible glitter on this website boasting an easy edible glitter recipe. You know what it is? Granulated sugar with food color in it. 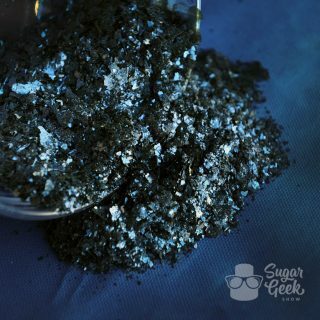 This is sometimes referred to as sparkling sugar or sugar crystals and MAY have a bit of a shine but is far, far from glitter. 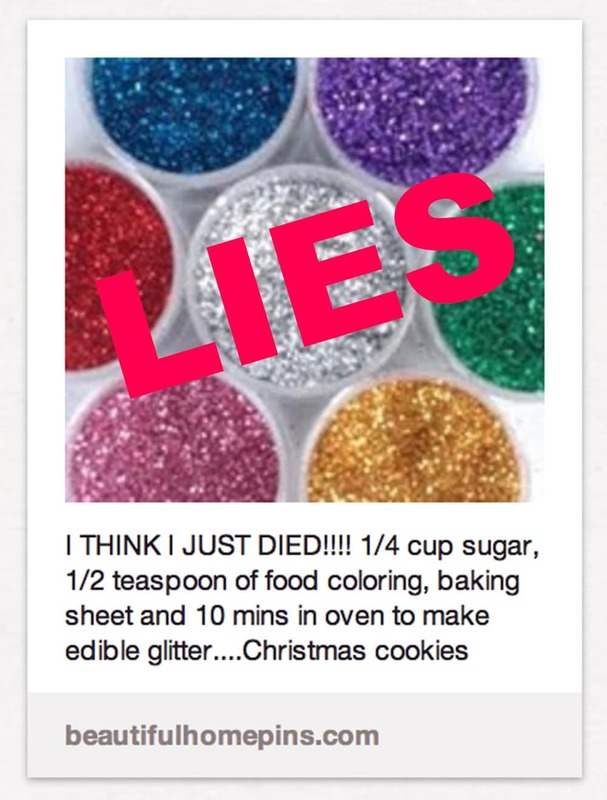 Don’t fall for this edible glitter tutorial fail. Where to buy edible glitter? So maybe you’re like me and sometimes you just do not want to make one more thing, you just wanna know where to buy it and be done with it! 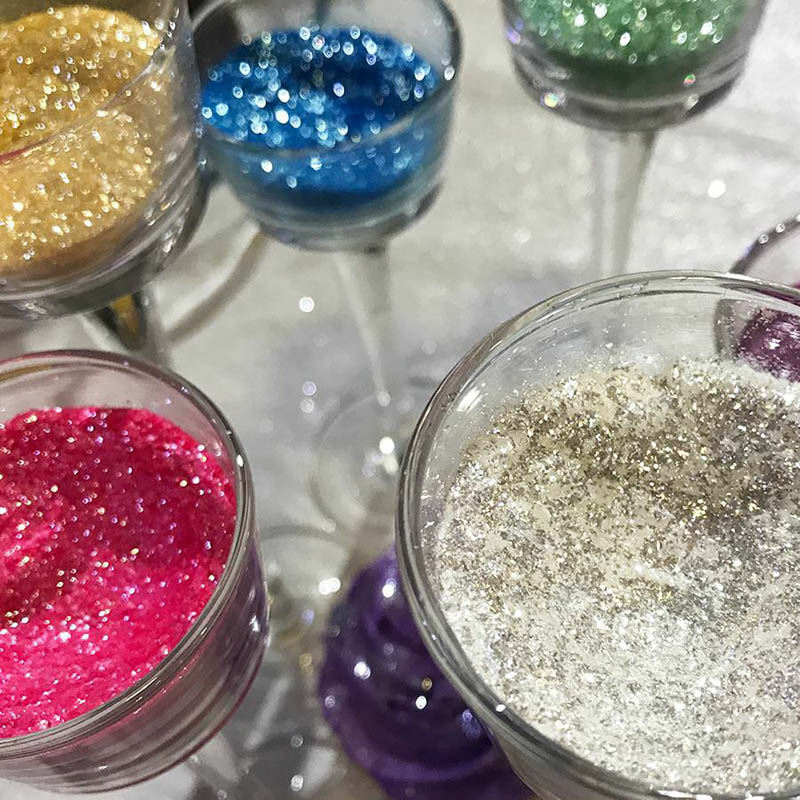 Well you’re in luck, there are a few FDA-approved, edible glitters out there. A quick google will bring up some searches but here are some links for your benefit. Watch my video on how to make edible glitter. Sub out the colors and metallics to customize them to anything you like! Spice Grinder This is pretty much a must for getting that superfine glitter texture. You can use a blender or a food processor but it’s almost impossible to get the really small pieces. Edible Gold Leaf If you want that extra bit of sparkle for your gold, you can add some gold leaf to the mix. It won’t be AS sparkly as real gold but it will be better than leaving it out. 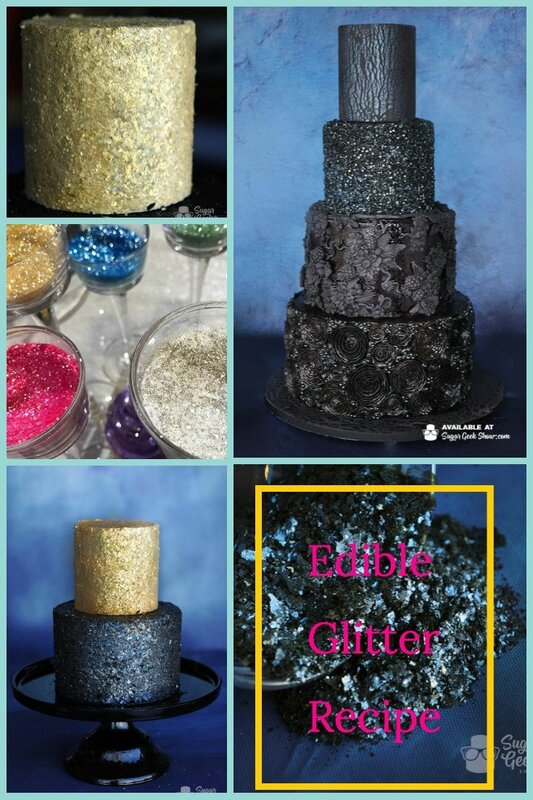 Edible glitter is easy to make and can usually made with ingredients already in your bakery! Make a little or make a lot to add some sparkle to your edible treats. Combine the metallic dust with the water and add to the melted gelatin. Stir well. Let the gelatin dry overnight. It might start peeling up on it's own or you may have to peel it up from the plastic to release it. Break it up or cut it into pieces. 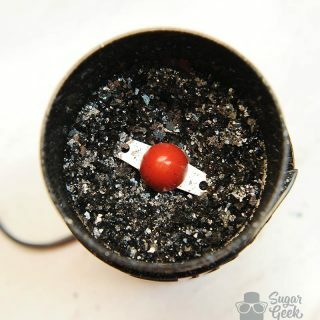 Place into a spice grinder or coffee grinder or even a food processor until it is very fine. Can use on anything edible! I am very new at this cake making/decorating and this tutorial was very helpful. This looks so awesome! I am a tea cake only shop and it would take me a while to I’m use all of that.I was wondering about the shelf life of this glitter recipe. How do you store leftovers? The glitter is shelf stable. It doesn’t have an expiration as it’s just gelatin. Could you add sugar/simple syrup to give it some taste? No you can’t add simple syrup to the glitter, it would inhibit drying and make it a sticky mess. 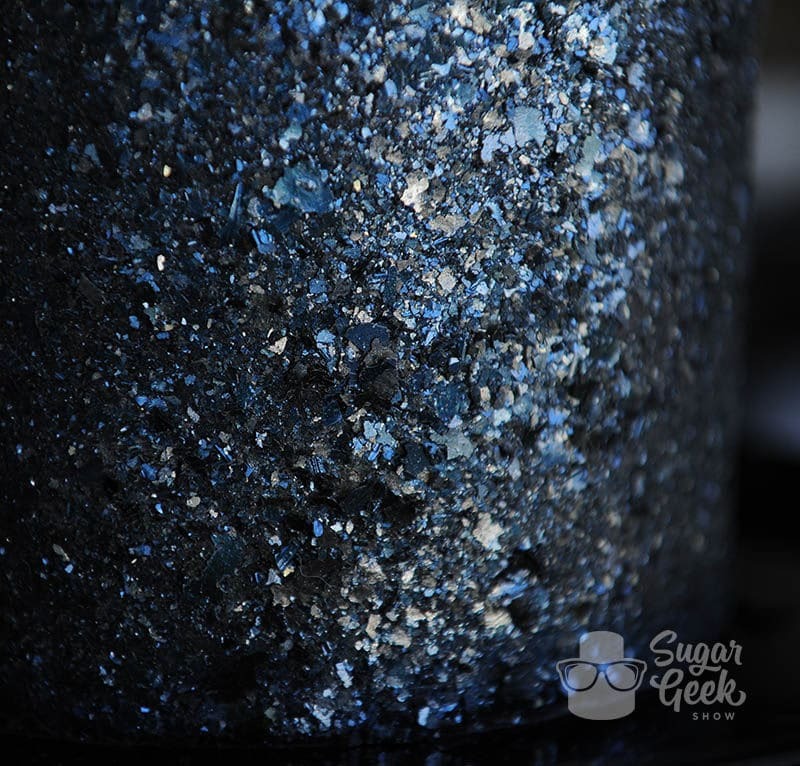 If you want your glitter to have a flavor you can add extracts to the mixture like you would to frosting or a cake recipe. 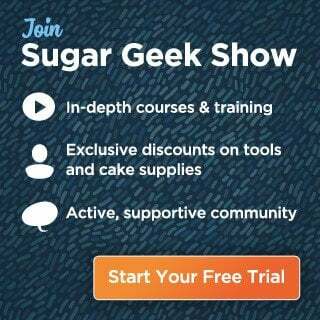 Can I add Gum Arabic to my gelatin mixture. To stabilize my glitter for use in hard candy? oh that sounds interesting! I’m not sure 😀 Give it a try and let me know if it works!